Our promise to you is to provide quality, preventative and complete dental care in a relaxed and friendly enviroment. The growth of our dental office has come from satisfied patients, who have referred a friend, family member or co-worker. They are appreciative of the gentle, quality dental treatment we have provided. People visiting our dental office for the first time have a lot of questions about our office, procedures and patient care. We pride ourselves in answering questions about your dental visit or any dental treatment that you may need. For decades it was a place for the faithful to gather. Now, it has been gracefully transformed into a dental office. 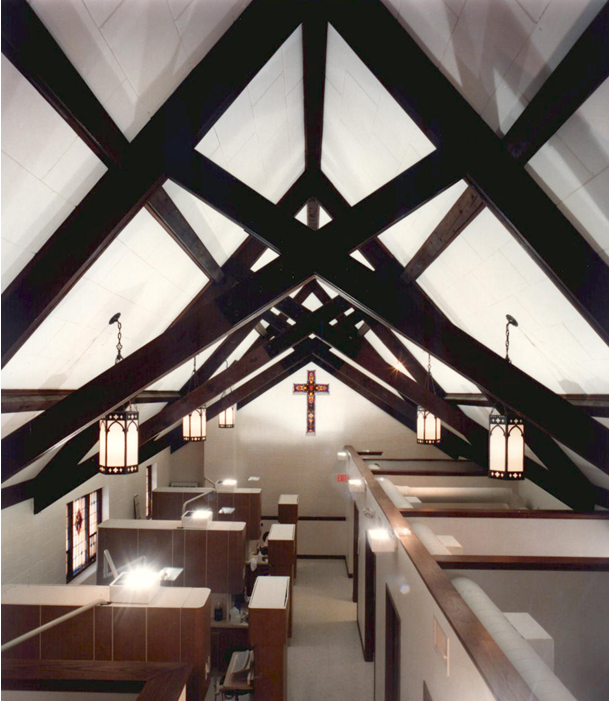 Once a church, originally constructed in 1947, this building offers an inviting and tranquil atmosphere for our patients. The arquitectural integrity of the building and the openness of the interior space have been preserved while integrating the funtions of a dental practice. Its original features include timeless lannon stone exterior, ornate wooden doors, beautiful stained glass windows, massive wooden beams and brass and iron light fixtures. A choir loft has been neatly transformed in to a private office. The interior space has been redesigned to accommodate a business office, reception area, four operatories, sterilization room, X-ray rooms, and more. Soft uplighting enhances the elegance of the original chandelier fixtures. In addition, each treatment chair faces a beautiful stained glass window.